Professor Ann Hershberger, interim director of Eastern Mennonite University's cross-cultural program, speaks during a panel session at the Aug. 15 faculty-staff conference. EMU has required some kind of cross-cultural study, whether through 3- or 6-week summer intensives or semester-long travel experiences, since 1982. Professor Kim Brenneman calls the cross-cultural experience “the ultimate classroom.” Most Eastern Mennonite University alumni who have participated in the program agree. Each semester and summer, EMU students spread out across the globe, usually accompanied by faculty and staff who have lived in the area and who, with the help of natives, introduce a perspective into the culture that is far more intimate than just visiting the usual tourist sites. The experience is much more unique than typical study-abroad programs in which students are housed in universities and take traditional academic coursework. Several graduate programs also offer cross-culturals, including the Collaborative MBA and MBA, MA in biomedicine [read more here and here], and Eastern Mennonite Seminary. View a timeline of EMU’s cross-cultural program. “I learned so much more about things I never even thought about at home, things I never thought existed to know,” she said. 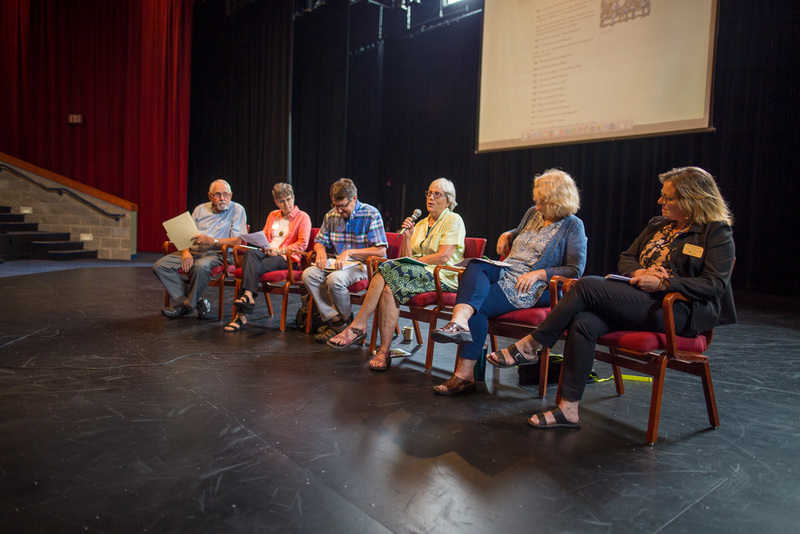 A panel discussion, “Drinking in Knowledge at the Source: EMU’s Cross Cultural Program,” at the 2017 faculty-staff conference discussed the origins, goals and changes over the years of one of EMU’s most unique programs, which started formally in 1982. Ann Hershberger is a nursing professor, director of the Humanitarian Action Leadership program and interim cross-cultural program director. She and her husband Jim have led several cross-culturals, most recently to Guatemala and Cuba. The couple spent 10 years in church-sponsored service in Central America. Linda Martin Burkholder, program assistant, has accompanied groups with her husband Brian Martin Burkholder, most recently to Bolivia. Ervie Glick, emeritus professor of German, was one of the first cross-cultural leaders. His introduction to the cross-cultural experience came with an alternative service tour in Austria with Pax, a program of Mennonite Central Committee created in response to the reinstatement of the military draft in the United States after the start of the Korean War. Glick helped to launch Goshen’s Study-Service Term in 1968 and led a year of this program (1969-70) in Guadeloupe, FWI. Kimberly Schmidt is a professor of history and director of the Washington D.C.-based Washington Community Scholars’ Center, housed in the Nelson Good House in the Brookland neighborhood. She has also led two groups to Europe. The first broad theme to be discussed was notable changes over the years. Technology came up several times. Instead of leaving behind their family friends, students have access to phones and computers, which leaders say can be a distraction and even a destabilizing presence. “It’s difficult for the experience to be an immersive one,” said Brenneman. This accessibility also impacts parental demands and expectations: “Some parents think that because their child can contact them every day, that they should be talking or Skyping every day, and when they don’t, that becomes a challenge for the student,” one panelist said. At WCSC, Washington D.C.’s rapid gentrification has changed the demographics and diversity of the area. Schmidt, a longtime D.C. resident, points out that when she first started as director in 1999, the city had more than 70 percent African American residents; that number has fallen to just over 50 percent. She pointed out, though, that the cross-cultural experience is very much shaped by the choices of the leader. For example, one could visit Germany with students, as she did this summer, and completely ignore the current refugee crisis. Her students did not; they interacted with Syrian refugees. “It’s all in how you teach it and what you expose your students to,” she said. Professor emeritus Ervie Glick posed a question about measurement of success to his fellow panelists. “There is no test afterwards,” he pointed out, adding that the extensive journaling required of student-travelers often provides a window into unwitnessed and subtle changes to student worldviews. Burkholder said a “growth in empathy” was a quality she considered to be a favorable measurement. One group of students, when visiting a poor area of a South American city, showed increased awareness of how their presence might be perceived negatively by residents. Brenneman shared an anecdote of two students who became lost in Kolkutta —“one of the safest cities in Asia” — and eventually, using broken Hindi, found their way back, exhilarated by their new-found confidence. Within a day of arriving at WCSC, Schmidt says students are sent on a scavenger hunt around the nation’s capital, using any combination of public transportation to visit known and not-so-known places. The tradition builds confidence in a very tangible way. 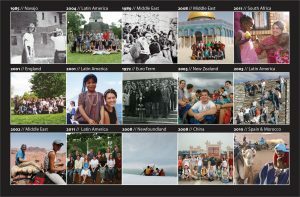 Visit a timeline to see the program’s history of travel and immersion around the world. Learn more about EMU’s cross-cultural requirement and visit the cross-cultural blog. Read more about summer 2017 travels to Europe, Bolivia, Navajo Nation and Spain. The Radical Roots group explored Anabaptist and Reformation history, with special attention to women’s history and to sites in Austria. The first theater-themed cross-cultural in fall 2016, led by Professor Justin Poole and his wife Amanda, attended 35 plays, visited 38 theaters, and produced their own dramatic piece about the different stages of cultural integration.